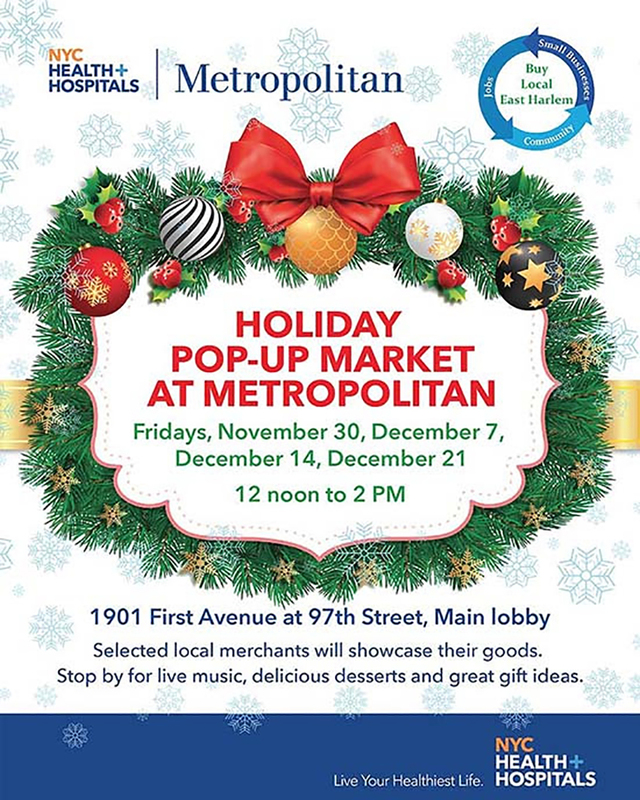 NYC Health + Hospitals/Metropolitan and Buy Local East Harlem are partnering to present a series of holiday fairs in the hospital’s main lobby. A select group of East Harlem-based merchants have been invited to showcase their products at a holiday bazaar on four consecutive Fridays from 12 noon to 2 PM: November 30, December 7, December 14, and December 21. The holiday fairs will include live music, delicious desserts and great gift ideas. Click here for an updated list of participating merchants each week. Join us for the ribbon-cutting on Friday, November 30 at 12 noon in the main lobby, 1901 First Avenue at 97th Street. Buy Local East Harlem is an initiative of the East Harlem Community Alliance, a consortium of over 185 nonprofits, businesses, religious organizations and government agencies working together to enhance the vitality and well-being of East Harlem. NYC Health + Hospitals/Metropolitan is the community hospital of choice for residents of East Harlem and neighboring communities. As part of the city’s public hospital system, Metropolitan is focused on providing a full range of health care services to all New Yorkers without exception.